The bird's colors stand out so clearly against the dun of the tree trunk. Makes him very visible! Great shot. what a wonderful shot - your explanation is very interesting, and this little bird is so expressive. What a fabulous piece of education here, Jane, visually and textually! Beautiful shot...the detail is amazing! I enjoyed your text as well. Nice! What's not to love? A guy in a tuxedo with a red hat? Beautiful! What an extraordinary capture...exquisite detail. Love the coloring of this little guy!!! Coolness. 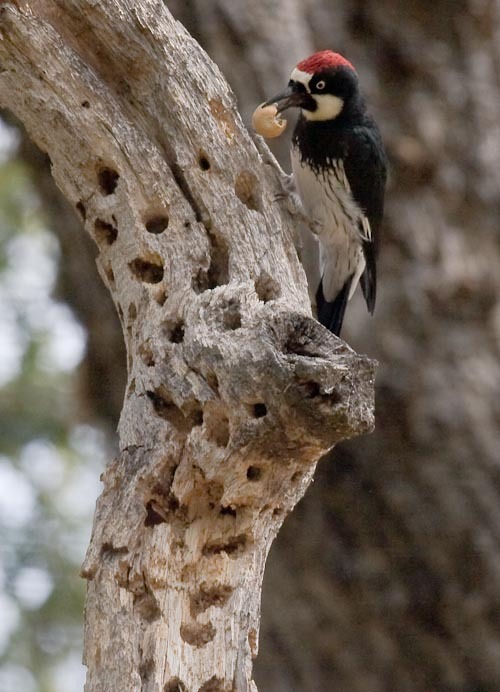 I've never even heard of the acorn woodpecker! he's just adorable!! and thank you for the informational bit about granary maintenance! I never knew!! excellent compostion and texture with that faaabulous holey winding branch! Jane, I finally went through the site, this is such a great image and an informative story. I didn't know about the moving.